Nora Roberts' books have the same underlying theme. Strong willed, independent, doesn't need anyone girl meets, strong, independent, doesn't need anyone boy and they fall in love. Its completely predictable. So, why read her. Because that is where the similarities in her books stops. Her strong woman usual have unusual jobs, talents, friends, etc. So that you are forced into a life that you don't have any knowledge of. Its amazing to me that she has written over 190 books, just under her own name. She also write as J.D. Robb. Now onto Chasing Fire. In this book Rowan is a fire jumper - and that pretty much is what it sounds like. She jumps into forest fires to wage the war of putting them out. Her father, Iron Man, did it for years before her, and now its her era. A new bunch of rookies arrives in the Spring and one of them, Gulliver has the hots for Rowan. They, of course, start and affair in which neither of them is sure will last. During all this, they fight fires and have the not so fun pleasure of dealing with someone trying to sabotage their operation. I will tell you what this book did, it made me re-think forest fires. Yes I enjoyed the writing and characters and everything but at the end of the book, what it really came down to was it made me re-think forest fires. You see them on the news all the time it seems. Raging, destroying everything they touch. You see it, but Nora made you feel what its like being in it. Sweating, burning, choking, bleeding in it. There are real men and woman fighting those fires. Real men and woman with families, risking their lives to fight those fires. What this book did for me is just made me appreciate all those people. Not just the fire fighters but everyone who is out there day in and day out keeping us safe. Doing the work we aren't strong enough, or brave enough to do. I thank them. I do. So this wasn't just a book. This was an eye opener. This was journey to another life style. And as always, with her books, I fell in love. The people, the job, everything about this life, Nora made me love it. 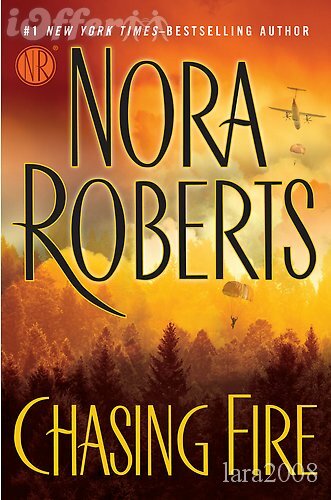 I recommend it to anyone who loves Nora Roberts.